When will I see Streetlight? 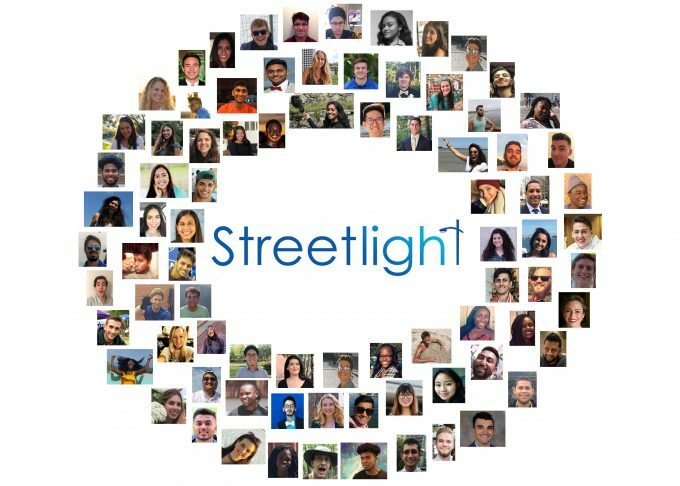 Streetlight is a program designed especially for you – a teen or young adult who spends some time in the hospital and away from school, friends, and life because of a serious health problem. Ultimately, we’re here for you as much or as little as you want. 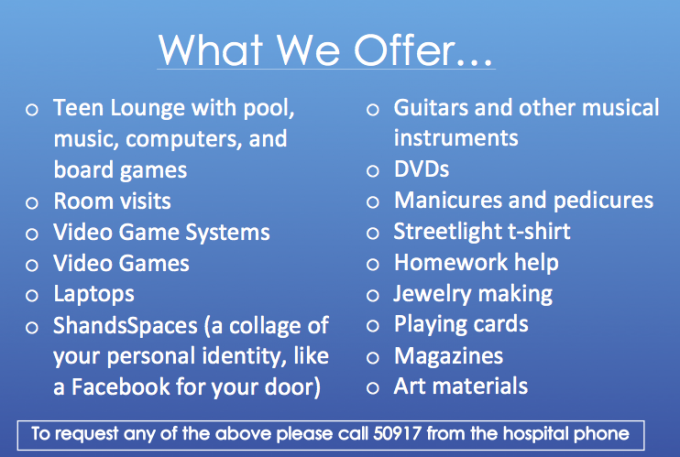 We know the hospital can get boring– and we want to help in whatever way we can. On your first admission you will be introduced to our program by one of our Streetlight volunteers. They will provide you with one of our brochures and contact information. If you are able to leave your hospital room, one of our volunteers will invite you to join us in the evening for our Teen Lounge. No worries if you can’t leave your room, we can hangout in your room during lounge time. Our hours for are room visits Monday-Thursday from 4:00PM-6:00PM, Teen Lounge shifts Monday-Thursday 6:30-8:30pm, and Friday afternoon from 2:00PM-4:00PM. What is the Streetlight Gaming League? The Streetlight Gaming League is a community for people who are going through similar situations to have a way to meet and have fun together through online gaming. Streetlight patients now have the opportunity to join the Streetlight Gaming League during their hospital admission as a way to play and connect with other Streetlight patients and volunteers. Or contact Drew Walker, Streetlight Assistant Director, at 352-273-9596, or via e-mail at andrew.walker@peds.ufl.edu . Whether you’re stuck at Shands or back at home, it’s a great way to connect with other people going through similar stuff and we are always putting on fun events to get involved in. Who are the Streetlight Volunteers? Medicine can do a lot, but there are some issues that medicine does not cover. The way we see it, sometimes a friend can be the most powerful source of support. The Streetlight team is made up of 65 college-aged volunteers that focus on building friendships through peer companionship. Dealing with a serious medical condition is a difficult journey, but you don’t need to go it alone. Our team members are selected for their personal experiences that may relate to your journey in the hospital. For example, we have Streetlight volunteers that are cancer survivors, some are living with sickle cell, or lupus. Below you will see our team collage for 2018/2019.